All crewmen completed their 25 mission combat tours. Dave L. Rogan (P) - Was original CoPilot on 1Lt James M. McDonald Crew 23 Jan 43 - 17 May 43 (17 missions). Upgraded to Pilot on 22 Mar 43. Flew 8 missions as Pilot 22 June 43 - 12 Aug 43 (8 missions) with Lt Donald Gamble as CoPilot on most of the missions and 1 mission as a lead crew CoPilot. Returned to the United States on 16 Aug 1943. Donald Gamble (P) - Was Rogan Crew CoPilot when Rogan was upgraded to Pilot. Became crew Pilot on 15 August 1943. Flew 3 missions as a Lead Crew CoPilot. Walter R. Kyse (CP) - Became the Gamble Crew CoPilot on 15 August 1943. Flew 2 previous missions as CoPilot with other Pilots. Upgraded to Pilot on 31 Dec 1943 when Donald Gamble completed his combat tour. Flew 9 missions as Pilot. (*) Flew most of their missions as members of the Rogan Crew (Through 12 August 43) and then with the Gamble Crew. Flew several of their last missions as members of Lead Crews. 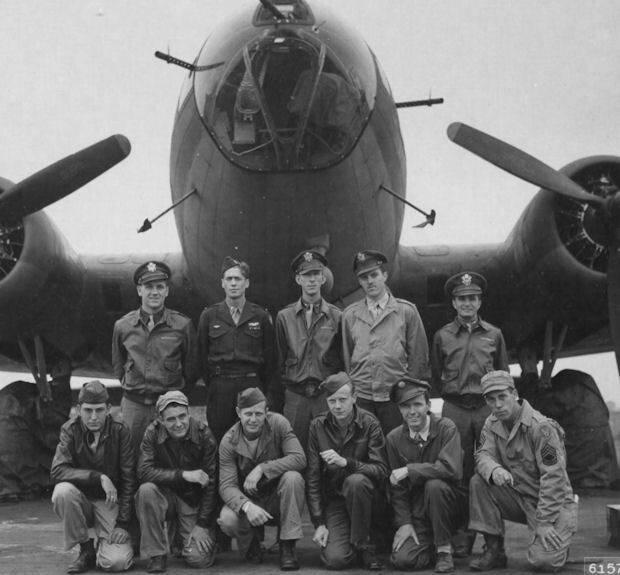 Note: Same photo appears with 358th BS Gamble Crew.